We have come a long way now. We have learnt many CSS concepts that can easily be put to use to design our website/webpages. In this tutorial, we will learn how to setup a basic webpage with a header, footer, sidebar and body section. This webpage also follows the same structure. We have a header, a footer, a sidebar with all the tutorials listed and the body part where the tutorial is. Header and Footer are basic, and we have only provided a background-color and some padding to it. You can add more styling to make them look different. 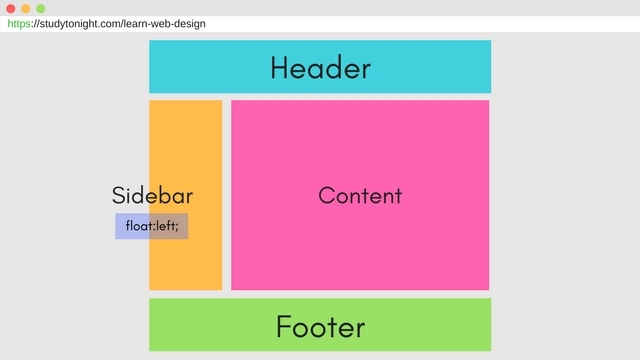 The #main-body style only has one CSS property of overflow:auto; to contain the floating sidebar inside it. We have added the CSS property float:left to our sidebar and to bring the content and sidebar side by side, we added a left margin equivalent to the sidebar's width to the content section. Finally! we know how to setup a basic webpage layout. To practice, move the sidebar from left side to right side. You will have to change the float property of the #sidebar style and the margin property of the #content style.